The world of Inzae lies beneath the world of Aihrde, bound but separate. It is a harsh world where all life struggles agains the power of iron and darkness. It returns to the TLG library at last with the official release of the Death in the Treklant series. These three adventures were originally published in 2000-2001 and chart a wild introduction into the world of Inzae. 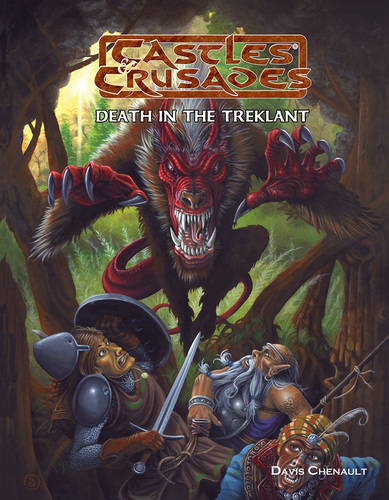 We saw a limited release of the three adventures in the Castles & Crusades Kickstarter, but here for the first time, the three adventures are bound in one volume. Vakhund. Dzeebagd. Felsentheim.